Last Friday Friday the Alliance of British Drivers attended a Transport Strategy Meeting hosted by the City of London Corporation. 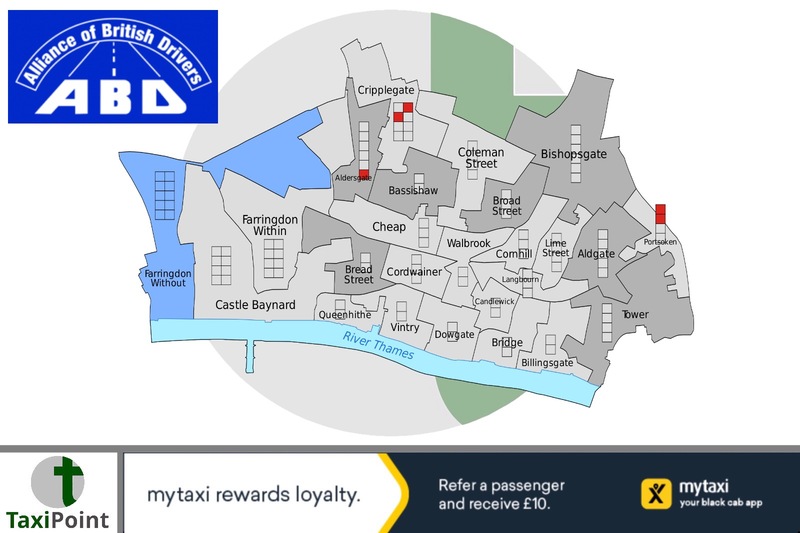 The Corporation covers the square mile and acts as one of the London boroughs in most respects. They are currently drawing up their 25-year Transport Strategy, are holding a number of consultation events and have done surveys. The consultation is still open so if you work, live or visit the City, make sure you respond.The meeting was hosted by Bruce McVean, Strategic Transportation Group Manager, and there were less than a dozen people attending most of whom seemed very unlike the typical City office worker who dominate the streets of London during the day, i.e. it was a very unrepresentative sample of those who might be affected by the proposed plans. The number of City residents attending also seemed minimal which is not surprising as there are so few of them.Bruce mentioned that a new “Road Danger Reduction and Active Travel Plan” was out for consultation which was news to me, but you can click here for more details.Bruce talked about the “draft outcomes” as they have clearly already come to some conclusions. Some of the evidence already obtained suggests that 60% of people think that pedestrian space is too small a share of street space and that cycling is under-prioritised. Bearing in mind that the vast majority of those surveyed or who have responded to the consultations will be pedestrians or cyclists this is perhaps not surprising. Should they not have asked a similar question of road users? Such as do you think roads are overcrowded and would you like more road space allocated to vehicles? One can guess the answer they would have obtained. Everybody wants “more” without consideration of any rational or economic allocation.Bear in mind that private cars are a vanishing species in the City. The roads are occupied mainly by buses, taxis and private hire vehicles, and goods vehicles. In fact 93% of travel in the City is already by public transport, walking and cycling. The Mayor of London’s target is 80% so the City already exceeds that, but Bruce said the Mayor would like it to be 99%! If the Mayor gets his way there would be no private cars or cabs in the City at all!Some 90% of on-street journeys in the City are already partly or completely walked – this reflects the reality of city commuting where several hundreds of thousands of people arrive at the main-line stations and walk to their office.I took the same conventional route to his meeting in the City of London Guildhall where the meeting was held from Cannon Street and walked through Bank junction. Still lots of vehicles ignoring the closure and no doubt collecting a fine as a result. Bruce suggested this closure was a major success when it does not provide any more space for pedestrians as a full redesign of the junction would have done. Neither does it fully solve the road safety problems at the junction as there are still likely conflicts between buses, cyclists and pedestrians. It looks like a proper solution is being kicked into the long grass while major damage to the road network is being implemented.Bruce indicated that there will be 90,000 more workers in the City in the next few years which may be true and will certainly put an extra load on the streets. Pedestrian space at certain locations is already very crowded (e.g. at Bank). I asked whether the Corporation knew where cyclists were coming from and who they are. It seems the Corporation do not know but are currently doing a study on that. I asked because I was sceptical whether cycling could help other than the minority of people coming from nearby boroughs and hence there may not be the growth in demand for cycling anticipated. A member of the audience suggested there might be a growth in “cargo cycles” as an alternative to LGVs.The “draft outcomes” already determined indicate that “people walking will have their needs prioritised” and that there will be “motor traffic reduction”. The latter and the change to lower emission vehicles will reduce air pollution (which is still a problem in the City which I noticed on my short walk even though the streets I walked through actually had very few vehicles on them at 2.30 pm – I just don’t understand why many people who responded to the survey felt that streets were “dominated by motor vehicles” – that’s not my experience on most City streets).The proposal is to use street space “more fairly and effectively”, and that includes the suggestion that “transformational change will be accelerated through temporary interventions and trialling projects prior to making permanent changes”. In other words more closures like Bank junction and closures perhaps of some streets at lunchtime as indicated in the aforementioned document.As I said to Bruce at the end of the meeting, the likely strategy seems to have been developed by deciding what they wanted to do and then doing a consultation based on asking the questions needed to get apparent support for it. The discussions at the previous Workshop event I attended do not seem to have been taken on board at all.It is certainly a priority to improve pedestrian space where it is currently congested (such as Bank) but that needs to be done without damaging the road network. I opposed temporary or timed closures because these create major difficulties for road users. Vehicle users should not suddenly find that their planned route is blocked and even Sat Nav devices get baffled by such timed closures.Removing vehicles altogether from the City is also not a viable suggestion. There is still a need for buses, construction traffic, goods deliveries and service operators’ vehicles. Even private cars and taxis provide a valuable service to a few people (and they are already very few – reducing them further won’t make much difference). I consider the suggestion that cargo bikes could take over LGV deliveries as a very inefficient use of labour and is unlikely to be cost effective.But you can see from this brief description of this event the way the winds are blowing. The City is following the Mayor’s Transport Strategy and other London boroughs are likely to follow suit. The road network will be degraded in the alleged interests of cyclists, pedestrians and environmental dogma.As regards the “Road Danger Reduction….” Document, the objective is zero KSIs (“Vision Zero” as it is called). A laudable if perhaps impossible objective unless all vehicles are removed and we revert to a pre-industrial age (cargo bikes are one example, perhaps rickshaws already common in the West End, and Sedan chairs will be next). But at least the Corporation have got around to working with the Police on a “Causal Factors Programme”. That involves looking at the causes of collisions and where they take place which may enable dangerous behaviours and locations to be tackled. This is similar to what other London boroughs have been doling for years. A statistical analysis approach of where, when and why accidents take place is one of the best approaches to improving road safety. That is of course different to the “driven by political gestures” approach such as the wide-area 20 mph scheme imposed on the whole of the City which has proved totally ineffective in reducing accidents. KSIs have not been falling in the City, not helped by increases in both pedestrian and cyclist numbers who are the main casualties. But one suggestion is to “research opportunities for timed closures to certain classes of traffic” which would be a retrograde step.Behavioural change is one approach being suggested. This arises from such problems as pedestrians stepping into the street without looking or under the influence of alcohol, and pedal cyclists taking unnecessary risks in their hurry to progress. The latter will be targeted by a “City Etiquette” campaign so that they take more notice of pedestrians. Education of all road users is one of the main themes, and people opening vehicle doors without looking is another problem that may be amenable to education.In summary, there are some useful ideas on the document, but it’s not likely to make major inroads into the road safety statistics unless more money is spent on road engineering. It’s not always an easy task to reconfigure roads in the City – Cheapside is a good example of what can be achieved. But schemes like Bank junction are surely ones to avoid.